Not to be confused with Borneo. The first Ice Camp Barneo ever near North Pole was established in 2002. Since that time, the camp has been rebuilt from scratch every year because of the constantly drifting Arctic ice. 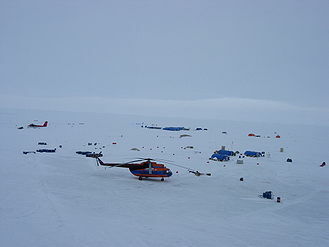 For example, in 2007 Ice Camp Barneo was located at about 89°31.5′N 30°27′W﻿ / ﻿89.5250°N 30.450°W﻿ / 89.5250; -30.450. However, northerly winds caused the Ice Camp to drift towards the southeast at a speed of 0.8 kilometres per hour (0.5 mph). The ice camp works under the patronage of the Russian Geographical Society and normally lasts for the month of April. Ice Camp Barneo should not be confused with the sequential Soviet/Russian "North Pole" drifting ice stations established by the Russian Academy of Sciences Arctic and Antarctic Research Institute (AARI). From 2002 to 2017, the starting and final point of all expeditions to Barneo has been Longyearbyen, the capital of the Svalbard archipelago of Norway. The town has necessary facilities including an airport, hotels of different levels, restaurants, a post office, a bank, and a supermarket. In 2016, following military exercises by Chechen paratroopers on Barneo, Norway enacted a flight embargo, which it later lifted. As a result, the 2017 event was expected to take place with a base in Russia. However, in March 2017 an expedition tour operator was taking bookings for 2017 and 2018 with flights operating out of Longyearbyen. ^ Alina Simone (7 June 2016). "A tussle between Russia and Norway at an exclusive resort at the top of the world". The World. Public Radio International. ^ "North Pole Express: Barneo Ice Camp". TUI AG group. Retrieved 12 March 2017. The University Centre in Svalbard is a Norwegian state-owned limited company that is involved in research and provides some university-level education in Arctic studies. The company is wholly owned by the Ministry of Education and Research, and the universities of Oslo, Bergen, Tromsø, NTNU and NMBU appoint the board of directors. It is led by a director appointed by the board for a four-year term. The centre is the world’s northernmost research and higher education institution, in Longyearbyen at 78° N latitude. The courses offered fall into four main science disciplines: Arctic biology, Arctic geology, Arctic geophysics and Arctic technology.